Desert views, ancient ruins and sand dunes in the Southwest. The Southwest is one of America's most famous landscapes. Contrary to popular opinion, though, it's more than just dust and cacti. The remains of ancient settlements, glittering gemstone logs, massive sandstone arches, imposing dunes, and, yes, more than a few saguaro cacti, make up the southwestern part of the country that's appeared in so many iconic pictures, paintings, and films. It's almost become synonymous with America itself. Mesa Verde National Park is a truly special place. On the mesa's cliffs, visitors will find the preserved dwellings of a civilization that is long gone. Pueblo Indians built the complexes in the thirteenth century, and the structures are still in a stable enough condition that you can tour them today! There are several groups of buildings to explore; some you can visit on your own, while others require a ranger-led tour. Stop by the visitor centers to see artifacts discovered at these sites and learn what historians have discovered about the people who once called this place home. The reason Route 66 became so popular was because it crosses some of America's most unique landscapes. The USA RV Park, just off the historic road, is a great place to soak up some of those old-school road-trip vibes. A nightly BBQ, a multitude of activities, and well-kept facilities are a great reminder of why road trips are so much fun. Another interesting Southwestern landscape is Petrified Forest National Park. You don't often find forests in the middle of the desert, but this isn't your average forest. The trees here are petrified, which means that they've been fossilized; a rare set of conditions has allowed hard, sparkly minerals to preserve the logs. Plus, the whole park is set in the stunning Painted Desert of Arizona, and Historic Route 66 runs right through it! Stop off at the Rainbow Forest to check out some petrified wood and desert views. Lost Dutchman State Park got its unusual name from the mythical Lost Dutchman Gold Mine, which, according to legend, is hidden in the Superstition Mountains somewhere near the park. There isn't even solid evidence of the mine's existence, but that doesn't stop thousands of tourists from flocking to the mountains in Arizona each year, hoping to find the mythical mine and to strike it rich. The legend varies wildly-- sometimes two German immigrants (hence the name "Dutchman") are involved, sometimes there's only one, usually named Jacob Waltz. There's even a version in which U.S. Army veterans stumble across the treasure. Sometimes the mine is found randomly, other times the location is revealed by Apaches. The treasure is either a vein of pure gold, or the abandoned mine of the Peralta family, or a cache of goods stolen from Mexican miners. The only thing that seems to remain consistent is the location: the Superstition Mountains. Saguaros, a rare type of cactus that can only survive in the harsh desert climates of Mexico, Arizona, and parts of California, have become a symbol of the Southwest. They can live up to 100 years and reach heights of 20 feet or more. You can see them at their most beautiful at Saguaro National Park. There are actually two separate units that make up Saguaro National Park, the Rincon Mountain District in the East and the Tucson Mountain District district in the West. The two are separated by the city of Tucson, so visiting the park is also a great excuse to explore the city. But back to the park! The Rincon Mountain District boasts tons of untouched wilderness, exotic wildlife, and plenty of hiking, while the Tucson Mountain District features ancient petroglyphs, an awesome interpretive center, and more saguaros than you can shake a stick at! Red Rock State Park highlights another desert landscape: the red sandstone canyons of Sedona. Oak Creek runs through the area, creating a rare riparian terrain that allows plant and animal life to flourish. Plus, many believe that the Sedona area is home to several healing vortexes, so take your time here, and soak in the good vibes. Perhaps the most famous National Park in America, the Grand Canyon National Park is every bit as epic as you've heard. Whether you plan to explore the North Rim, the South Rim, or both, make sure to check out several observation points, take a hike, and make the most of your visit. It really is one of those places that you can't fully appreciate until you've seen it in person! Like Mesa Verde, Navajo National Monument protects ancestral Pueblo cliff dwellings from around 1200 AD. There are three main dwellings, several trails, scenic overlooks, and a visitor center that provides tons of background info about the ancient people who lived here. If you can, check out the Keet Seel dwelling; archaeologists consider it to be one of the best-preserved larger ruins in the Southwest. 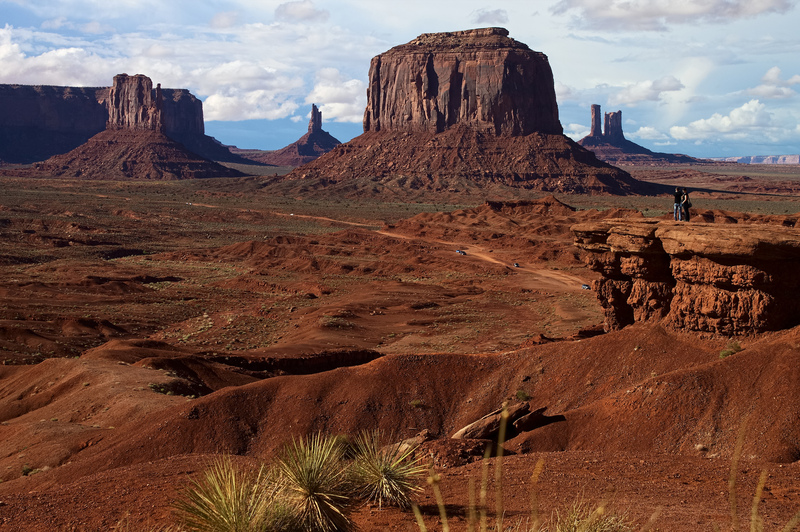 Monument Valley is easily one of America's most iconic settings. Featured in countless movies, from westerns to "Forrest Gump", the vast sandstone buttes and "mittens" rise up from the ground, with few signs of civilization around to mar the view. Hop on U.S. Highway 163, and cruise through the valley. It's only about five square miles, but the impression it leaves on visitors is huge. It doesn't get any more Western than a campground with a steakhouse on site. Duke's offers breakfast, lunch, and dinner, and serve up huge burgers, baby-back ribs, chicken-fried steak, ribeye, brisket, and more. You can sleep off your food coma at your campsite right next door. What's not to love about Capitol Reef National Park? It's got awesome hikes, stunning scenic drives, breathtaking landmarks, a fascinating history... and it's one of the lesser-visited parks in Utah. Learn about the park's outlaw history (these are the old stomping grounds of Butch Cassidy and his Wild Bunch), see the massive rock formations on a hike through Cathedral Valley, and keep an eye out for the white sandstone domes that earned the park its name; some think they look like the dome of the U.S. Capitol building! The Escalante National Monument is, in a word, incredible. It's utterly massive, at 1.9 million acres, and it's also pretty remote. But, that means that Escalante is the best place to enjoy the desert as it was meant to be seen: untouched and totally wild. If you're a little worried about hiking into the desert wilderness, then explore the area from the comfort of your vehicle on a scenic route, such as the Burr Trail. Great Basin National Park is another underrated stop in the Southwest. This hidden gem in Nevada features glacier-capped mountains, grizzled bristlecone pine trees, mysterious caves, peaceful lakes, and tons more. It's not exactly the most obvious picture of the Southwest, but part of the appeal of the region is just how varied it is! Arches National Park is incredibly popular, and it's not hard to see why. There are more than 2,000 sandstone formations here that are begging to be explored! Double Arch and Delicate Arch are two of the more popular arches, and both are easily reached via short hikes. If it's too hot for much outdoor activity, there's a scenic drive that loops through the park, offering equally epic views. Slightly more remote and less developed than nearby Arches, Canyonlands National Park provides a slightly different look at the Utah scenery. The park is made up of several different units, and they're all fairly separate from each other, so decide which you want to see before you visit. The Needles District is popular for its many trails, scenic overlooks, and multicolored sandstone spires! Covering nearly 3,000 square miles of wilderness, the San Juan National Forest offers mountains to climb, scenic byways to drive, ghost towns to explore, and loads more. A quick trip from quaint towns such as Ouray and Durango, the forest provides striking beauty from nearly every angle. Wolf Creek Pass is a highway that traverses the beauty of the San Juan Mountains. In addition to marveling at breathtaking views, you'll pass by Treasure Falls, great ski resorts, and relaxing hot springs. The pass a popular route for tourists, as it offers mountain scenery as well as an easier drive to navigate than other roads in the area, especially during the snowy winter months. Whether you're looking for a cozy cabin or a simple campsite, you'll find it at the scenic Riverbend Resort. The convenient location, added amenities such as a hot tub, game room, and laundry facilities, and the gorgeous setting make this a great place to relax for a night or two while exploring Colorado. Great Sand Dunes National Park is dedicated to protecting and preserving the 750-foot-tall piles of sand within Colorado's San Luis Valley-- and to helping people explore and enjoy the dunes! The wind and sand do make hiking a bit of a challenge at times, but it's well worth it to climb to the top of the dunes. The views of the sand and the mountains are unlike anything else you'll ever see! From red sandstone arches to scrubby deserts to forested mountains, the American Southwest is an enchanting and distinctive place where petrified forests are made of glittering gemstone minerals, healing vortexes abound, and buried treasure isn't so far-fetched an idea!